Or call us at : +91-9810073055. Off-White or Purple/Red color or Brown wettable powder (WS). Packing: 25kg/Fibre drum; 30g, 75g bottles. Usage: The product is a broad-spectrum, high-effective, low-toxic systemic insecticide. 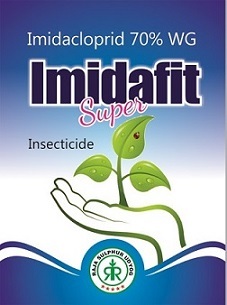 It can be used to control aphids, leafhoppers, whitefly, thrips, etc. on potato, citrus, fruit trees, cotton, vegetables, etc. Available in small and bulk packs. Manufacturer: RAJA SULPHUR UDYOG, India. FOR AGRICULTURE USE ONLY. All information given here is given in good faith only and carry no guarantee. Users are advised to verify the informations and standards of the product & usage at their end. Packings, labels, designs and product shown here may change or differ from the actual supplied. The site is best viewed with FireFox / IE4.0 browser or Netscape6.2 and above. Get the latest Internet-Explorer for free.